This quick pasta recipe is a great way to make a filling dinner in a snap! When it comes to making quick weeknight dinners, this creative pasta recipe is hard to beat. Garlic, olive oil, two kinds of tomatoes, beans, and herbs all come together to make this dish utterly unforgettable. Stir-frys are a great way to meet your daily vegetable requirements. This one is filled with nutrients, and it doesn’t skimp on the flavor either. This skillet meal is very tasty and easy to make. Slices of chicken are cooked in a seasoned sauce with lots of veggies and beans. This delicious salad is a meal by itself. It’s packed with nutrients! This spicy marinara sauce goes very well with the nutty taste of whole grain pasta. It has lots of color, texture, fiber, and nutrients. Spinach contains lutein, which is a phytochemical that may help protect your vision. This tasty salad is a hit at picnics and potlucks! 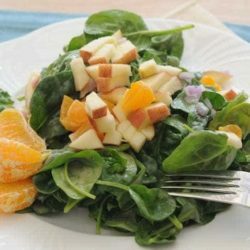 Enjoy this warm salad for lunch or dinner. It features fresh, seasonal vegetables! 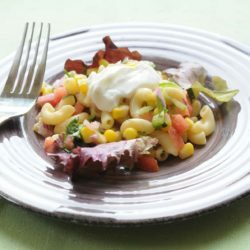 Make this delicious macaroni salad for lunch or dinner.